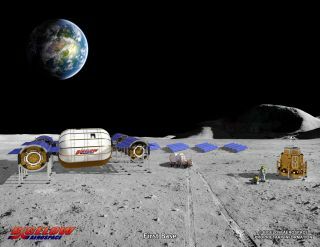 Representatives with Bigelow Aerospace plan to build bases on the moon. A rocket carrying more than a dozen privately built probes touches down on the moon. The robots burst from the vehicle in a race to beam back high-definition video and other data while roving the surface of Earth's nearest natural satellite. The people of Earth watch a broadcast of the race as the rovers roam (or stall) in the lunar dust. The motives that drove teams to send these robotic emissaries to the moon might be different — ranging from inspiring a country to starting a sustainable, commercial endeavor — but they have all flown the more than 200,000 miles (321,000 kilometers) to the moon, riding on a wave of commercial hopes that rest on the lunar surface. "For the X Prize, we're going to carry multiple X Prize teams with us to the surface," said John Thornton, CEO of Astrobotic, a team competing for the Google Lunar X Prize private moon race. "It's going to be a little bit like NASCAR on the moon, where we're going to have multiple rovers deploying. These are rovers from different nations, different X Prize teams, and we'll be competing for the biggest prize ever, streaming live from the moon … You can see these HD videos coming back as the competition is unfolding, as other countries are competing with our rover." Eighteen teams are currently competing to win up to $30 million as part of the X Prize which will be awarded to the first private team that successfully launches an unmanned mission to the moon and meets a set of objectives. To win the grand prize, a team needs to be the first to send video and other data back to Earth, as well as travel 1,640 feet (500 meters) on the moon by Dec. 31, 2015. For centuries before Apollo 11 landed on the moon, the idea of going there stirred people's imaginations. See Space.com's complete look at humanity's love affair with the moon in this infographic. The motives behind the newest ventures to explore the moon are markedly different from earlier reasons for sending humans and equipment to the natural satellite. NASA launched the Apollo missions 45 years ago to beat the Soviet Union in the space race. Many of today's lunar entrepreneurs have different goals in mind — ones that sometimes don't have anything to do with what space agencies around the globe are doing. Some companies might be interested in lunar tourism, others have a desire to mine the moon for resources and still others see the moon as a potential second home for humanity. "The first question is why anybody is interested in the moon," said John Logsdon, a professor emeritus at the Elliott School of International Affairs at The George Washington University. "One, it's an interesting object, but probably for many potential explorers, the most interesting thing is that it's close. It's just an offshore island, where[as] any other destination in space is weeks to months away. Any private organization, and most nations interested in going beyond low-Earth orbit, are going to be focused on first going to the moon." Ideally, the Google Lunar X Prize competition will help to create an industry based around commercial motivations for visiting the moon, representatives for the organization have said. Bob Richards, founder of the Google Lunar X Prize team Moon Express, was involved with spaceflight ventures for years before the competition came to be. Moon Express engineers are currently in the process of testing the technology necessary to move their robotic craft around on the moon. Richards sees the team's participation in the X Prize competition as a way of furthering a goal he's been thinking of for years. He doesn't want this lunar landing to be a one-off experience. Instead, Richards believes that there is a market for, and interest in, bridging the gap between Earth and the rest of the solar system, starting with the moon. "The founders of Moon Express believe in the value of the moon and its resources to life on Earth and our future in space as a space-faring, multiworld civilization — and the investors do, too," Richards told Space.com. "In the long term, we're looking to develop, basically, a railway to open up the possibility of lunar resources complementing our economy here on Earth, expanding our economic sphere out to the moon." Other teams, like Israel's SpaceIL, are more focused on the Earthly possibilities of the X Prize. The company's probe may be tiny, yet it's designed to not only get to the moon, but also inspire young Israelis back on the ground, said SpaceIL co-founder Kfir Damari. "Today, when we look at it, our mission is to land the first Israeli spacecraft on the moon," Damari said. "Our vision is much, much bigger. It's to inspire the next generation of scientists and engineers to develop technologies that will help humanity to research the universe … We are working hard to win the competition, but the vision is much, much bigger." Meanwhile, Astrobotic's Thornton thinks that humans should build a sustained presence on the moon. By using pits and other features that could bring people and technology below the lunar surface, humanity could extend its reach to the moon, Thornton said. Thornton and representatives for Astrobotic see the X Prize as a way to kick-start a lunar industry. "We'd be perfectly happy landing on the moon and placing last in the X Prize," Thornton said. "That would be fine by us. For us, the big win is to commercially land on the moon, and open up the pathway to the moon." Other companies unaffiliated with the X Prize are even looking into building lunar bases and creating a tourism industry centered on the draw of the moon. But all this commercial interest in digging into the lunar dirt doesn't mean that nations around the world don't have a role to play in the future of spaceflight or lunar exploration. Even representatives of companies interested in sending private crafts to the moon admit that commercial industry can't do everything right away. Sometimes, nations need to lead the way into uncharted territory. "You won't see private companies doing science for the sake of science or doing exploration for the sake of doing exploration," Thornton said. "I think that's where the space agencies need to be leading. They need to be leading in the direction of eventual settlement of the moon and eventual settlement of Mars. That's hard. That will be a very difficult thing for commercial to do." "The moon is within reach of private operators operating on modest budgets, but it's also within reach of nations that are not spending an immense amount of money on space," Logsdon told Space.com. Plans that have been announced in recent years for crewed space flights to the moon. See who's aiming for new manned moon missions in this Space.com infographic. While NASA led the way to the lunar surface in 1969, it doesn't look like the space agency will be launching any manned missions to the moon anytime soon. The U.S. agency is not planning to return astronauts to the lunar surface, instead opting to send a crew to an asteroid pulled into orbit around the moon. The new undertaking is thought to be a testing ground for an eventual crewed Mars mission. At one point, the United States was planning to return to the moon with the Constellation Program — designed to deliver astronauts back to the lunar surface — but that plan was canceled in favor of the asteroid redirect mission after President Barack Obama took office. "Personally, I think the asteroid mission was a good plan, as it had elements suitable for robotic missions and human spaceflight, and it was a new destination, with multiple milestones," said Joan Johnson-Freese, a professor at the U.S. Naval War College. "The 'new' part being important, as it took the U.S. out of a potential race back to the moon, against China, which the U.S. could well lose — not for lack of technical capability, but for lack of political will." In fact, it might actually be easier for nondemocratic nations to forge the way back to the moon, Johnson-Freese said. "While human spaceflight holds great attraction for the public in many, if not most, countries, it is very difficult to actually pursue in democracies, where people have a voice in what the government funds," Johnson-Freese told Space.com. "It is viewed as a good thing to do, but expendable when juxtaposed against government programs like housing, jobs, education and defense. Countries like China can pursue human spaceflight on its own because the government, not the people, gets to choose what it funds." China has plans to go to the moon. The government is aiming to launch a mission to return lunar samples back to Earth sometime in 2017. In 2013, China became the third country to soft-land a robotic craft on the lunar surface. Government officials are also working on developing technology that could bring Chinese astronauts to the moon. Russia also has lunar plans. Officials are reportedly planning to launch robotic missions to the moon starting in 2015. The private company Space Adventures is also hoping to use Russia's Soyuz rockets to take tourists on a trip around the moon for about $150 million per person, with cosmonauts leading missions. Though NASA officials are not planning to forge a way back to the moon, it doesn't mean that scientists and engineers at the agency have lost interest in the moon. NASA recently launched the Lunar CATALYST program, designed to help private companies interested in going to the moon. CATALYST (short for Lunar Cargo Transportation and Landing by Soft Touchdown) is a program that provides unfunded NASA support for a select group of private companies that want to pave a way to the lunar surface. Though NASA will not provide funds for the three companies selected for Lunar CATALYST, officials will give Moon Express, Astrobotic and Masten Space Systems use of NASA facilities and technology. "From a commercial standpoint, we have seen, in this agency and across the federal government, a look at ways to work with the commercial sector," said NASA's Nantel Suzuki, robotic lunar lander program executive. "Public-private partnerships are being examined in new ways." NASA has successfully partnered with private companies before. Two private organizations are currently flying robotic missions to the International Space Station for the agency. NASA is also partnering with companies to create a ferry service to the space station that could begin flying as early as 2017. The CATALYST program doesn't necessarily have the same goal as NASA's other commercial partnerships, however, Suzuki added. "If we look at the moon, we don't have an anchor guarantee of any kind — nothing like an International Space Station that will be orbiting and requiring a steady supply of cargo over X-number of years," Suzuki told Space.com. "We don't have that on the moon, so it doesn't really make sense to have the analogous service contracts at this time — something akin to the CRS station cargo supply." One spaceflight veteran thinks that NASA's role should be to facilitate the growth of other nations that want to fly people to the moon. Apollo 11 astronaut and second man on the moon Buzz Aldrin thinks that the United States should help other countries get off-world. "Let's try doing something that doesn't compete with prestige-seeking nations sending their citizens to kick up dust on the moon," Aldrin said during a Google Hangout with Space.com earlier this month. The United States should help other nations by placing robotic probes on the moon that can be used to explore and aid other nations' lunar ambitions, Aldrin added. It's also possible that countries could use the moon as a jumping-off point to access other parts of the solar system, like Mars. By building up and mining the moon, groups could be able to extract material that can be used to fuel rockets and bring people farther into space than ever before, said Robert Bigelow, founder of Bigelow Aerospace, a company aiming to develop the capability to land a base on the moon. The moon could also act as a proving ground for future missions to other places in the solar system. "The moon is kind of the mother of all locations for which you can really have a sizable operation scattered over the surface in a lot of different areas," Bigelow added. "This doesn't just involve the United States. We're going to have multiple nations involved in lunar operations." The Bigelow Aerospace plan hinges on the idea that private companies and nations will be interested in having a base on the moon. Those groups could contract Bigelow to build a base and fly it to the lunar surface, where they can then mine, experiment and settle on the moon. Different companies and countries could have specific bases built by Bigelow and designed to fit their needs. Another company, Golden Spike, also plans to help launch people to the moon. At first, officials with the company plan to provide interested nations with the capability to launch their astronauts on a round trip to the lunar surface for $1.5 billion per flight instead of starting from scratch. "It's basically an opportunity for any foreign nation to have their own people travel to the moon to explore, to excite their population, to create motivations for STEM [science, technology, engineering and math] education, or any other purpose they like," Alan Stern, CEO and president of Golden Spike, told Space.com. "The offer is a much safer, a much quicker and a much less expensive alternative to developing their own lunar program." The company plans to use existing, tested technology to fly astronauts to the lunar surface. Representatives with Golden Spike plan to buy rockets and capsules — like those already in development for NASA's commercial crew program — for the lunar missions. According to Stern, Golden Spike should be ready to fly the first missions in six to seven years. Golden Spike could also eventually provide flights for private organizations like Bigelow who needs to get people up to the lunar surface safely, Stern said. Exporting problems to the moon? A utopian view of future moon exploration — in which different nations, scientists and private companies can harmoniously work side by side — might not be immediately probable, however. It's possible that conflicts could erupt on the moon, just as they do on Earth. "If we look at our history, the human being did not have a very pristine history of peaceful coexistence," Bigelow said. "So we had better wise up. We had better start to change our behavior here, and we cannot export, off of Earth, the same irresponsible behavior that we not only are conducting today on this planet, but have conducted for millennia. As human beings, our record is absolutely terrible. I think we owe a responsibility to space exploration, space existence of an entirely different level of attitude and respect." Countries and private organizations alike will also need to set up rules and regulations governing exactly who lays claim to any particular plot of land on the moon. As it stands now, no country can "own" a part of a celestial body according to a United Nations treaty introduced in 1967 and eventually signed by 128 nations. No matter what the future of lunar exploration holds, the Google Lunar X Prize moon race will be televised. Officials with the competition have announced that they are partnering with the Science Channel and the Discovery Channel to cover the race from testing to the landing, so that Earthlings can catch every minute of the new lunar action. Follow Miriam Kramer @mirikramer and Google+. Follow us @Spacedotcom, Facebookand Google+. Original article on Space.com.